When a family member or loved one is killed at the hands of a negligent individual, the emotional, physical and financial impact seems impossible to bear. The sense of loss and grief felt by surviving friends and family members and friends can be overwhelming. While no sum of money can bring your beloved back, it can compensate you for your loss and help you transition through this immensely difficult period of your life.The attorneys at Chambers & Noronha understand the complex emotions and financial needs of our clients. We are steadfast advocates for our clients, and we diligently prepare each case for trial. Southern California individuals, businesses and insurance companies are well-acquainted with our firm’s name and our attorney’s methods. We are known for our aggressive representation and our dedication to our clients. By employing the expertise of accident reconstructionists, doctors and economists, we are able to build detailed cases for our clients. As educators, we are committed to giving our clients the information they need to confidently navigate the legal system. Each of our attorneys has tried numerous cases. We make an investment on behalf of our clients so they can proceed with confidence. 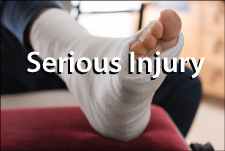 We will not charge any fees until or unless we obtain compensation for you. To schedule your free initial consultation with one of our wrongful death lawyers in Santa Ana, please email us or call 714-558-1400.